In a ceremony today Ford Motor Company hosted Joey Logano, the 2018 Monster Energy NASCAR Cup Champion. 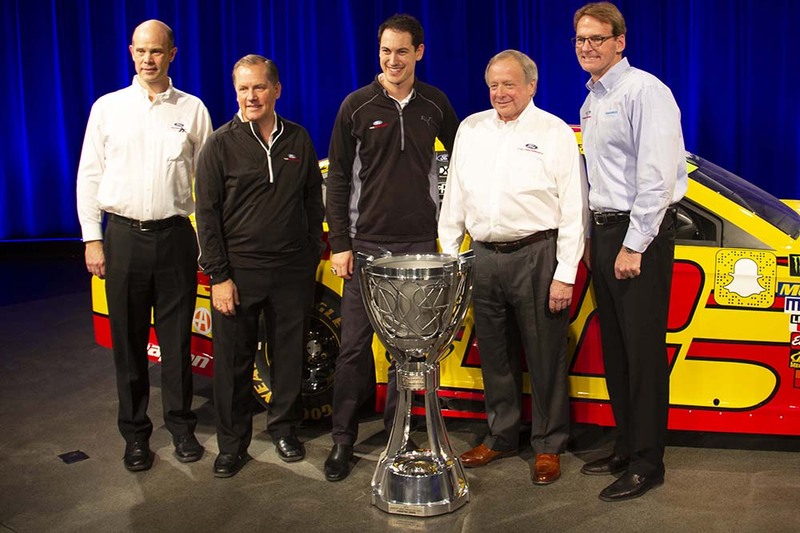 Logano, his crew chief Todd Gordon, and their #22 Shell Pennzoil Ford Fusion sat on stage at Ford World Headquarters. The ceremony, hosted by Mike Joy from Fox Sports, honored Logano for his first Cup Championship. Ford celebrated their first Driver’s Championship since 2004 when Kurt Busch won for Roush Racing. Logano’s win also gave Ford the 2018 NASCAR Manufacturers Championship. Ford’s first since 2002. The last time Ford won both Championships in the same season was 1999. Dale Jarrett, driving for Robert Yates Racing, accomplished the driver’s share. Edsel Ford spoke on behalf of the company. Expressing his appreciation to Logano, Gordon and Team Penske for delivering the victory that ended the long championship drought. 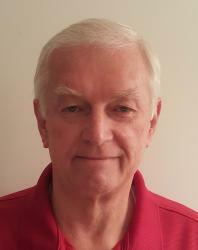 Doug Yates, of Roush Yates Engines, earned the Mahle Engine Builder of the Year award. 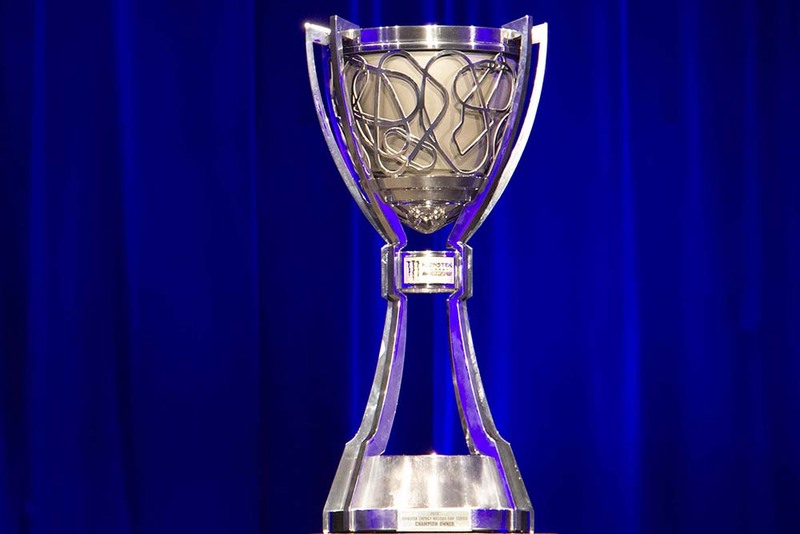 The award presented by the National Motorsports Press Association is part of the prestigious Myers Brothers awards presented annually. Edsel congratulated Yates and reminded everyone that “Motor” is the company’s middle name. Roush Yates Engines is the exclusive engine builder to Ford Performance. 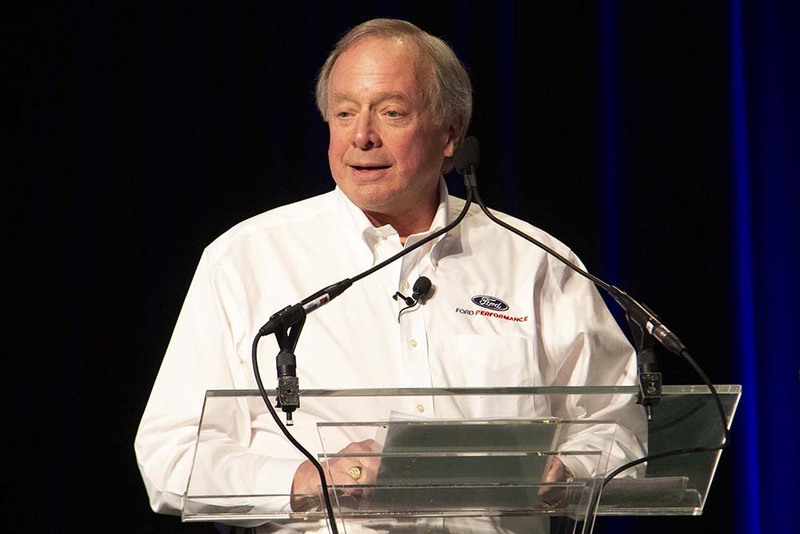 Mark Rushbrook, global director of Ford Performance Motorsports, also joined Edsel Ford in praising Yates for the power and durability of their motors. The Ford Fusion scored its 100th victory on the NASCAR Cup Circuit earlier this year. The model is now officially retired. In 2019, the Mustang replaces the Fusion as the vehicle to carry the Blue Oval logo. 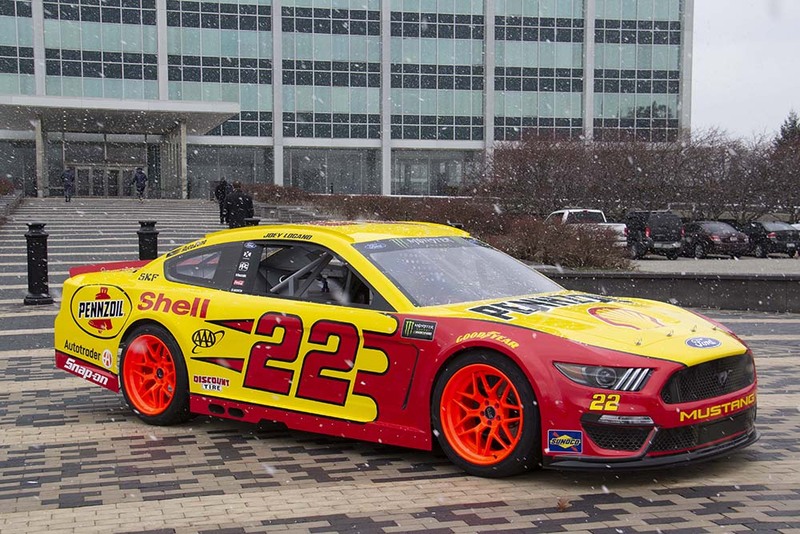 Ford Performance displayed the 2019 NASCAR Mustang body with the Shell Pennzoil paint scheme at the entrance to Ford World Headquarters. A few snowflakes reminded everyone Dearborn is in Michigan and winter is fast approaching. Only 81 days until the 2019 Daytona 500. We will be counting them down. 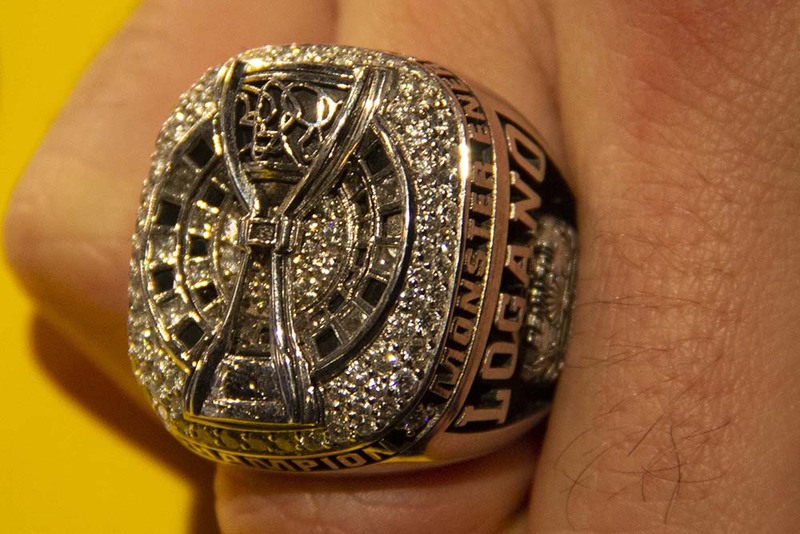 He also sported the Championship Ring he received at last weeks NASCAR Championship Award’s banquet. Too many diamonds to count. Logano walked away from today’s event with an additional item to carry. Showing Ford’s appreciation of Logano not for just being a great driver but a great person. 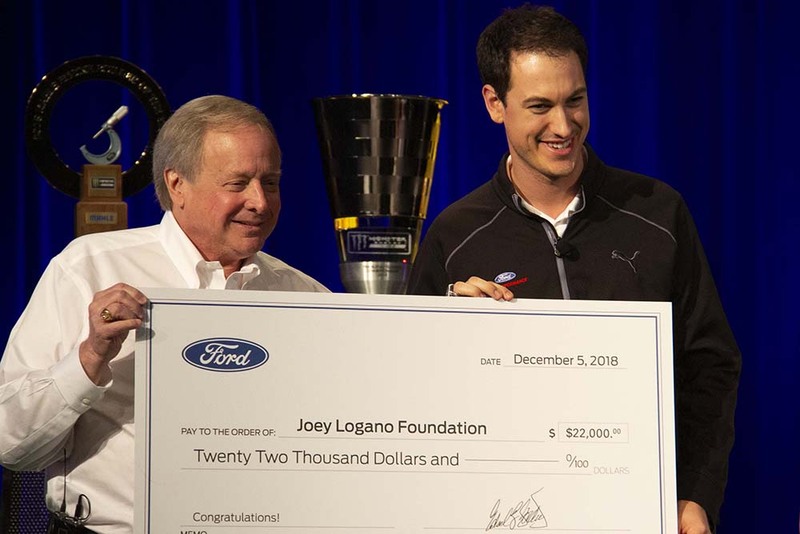 Edsel presented The Joey Logano Foundation a check for $22K dollars. He also related the story of how Joey and his wife Brittany spent the night before the Championship Race. They were handing out Turkeys for Thanksgiving dinner at a grocery store not far from Homestead-Miami Speedway. Not that’s a Champion. Look to The Lasco Press for offseason NASCAR updates and our 4th year of Cup Series coverage beginning at Daytona. Race fans. Have a great holiday and we’ll see you in 2019.